State National Guard chief dis.. Weighing the Real Moneyball Qu.. According to the Centers for Disease Control, 80% of African-American women are overweight. Former Blue Raiders Toni Carey (’05) and Ashley Hicks (’05) are trying to do something to improve those frightening statistics. In 2009, Carey (pictured at left) and Hicks (right) created Black Girls RUN! 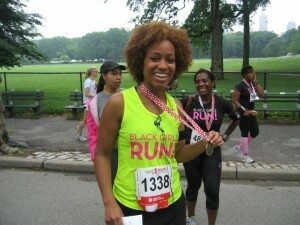 (www.blackgirlsrun.com). Their mission is to encourage African-American women to make fitness and healthy living a priority, thereby lowering the number of women with chronic diseases like diabetes and heart disease associated with an unhealthy diet and sedentary lifestyle. chapter president while Carey was treasurer – meaning the pair worked on many projects together during their college years. That synergy was revived when Hicks – a former PBS documentary maker, recent Columbia University graduate and current nonprofit marketing manager based in Atlanta, formed BGR! with Carey, currently a publicist based in Virginia Beach, Virginia. GBR!, which started as a blog filled with information about running, nutrition and health, is now a coalition of almost 60 running groups across the U.S. representing an incredible 25,000 women (see http://www.blackgirlsrun.com/running-groups/). Many of those members have started running in half or full marathons, or starting with 5K races. “It makes us feel good about what we’re doing,” Hicks says. One particularly feel-good moment for Hicks occurred at a recent marathon in New Orleans where 130 BGR! members from across America traveled to that city to run with Carey and Hicks. Other goals are to expand the program to teenage girls, as well as to cultivate running groups in the so-called “Stroke Belt” – the deep South – where obesity in African American female populations is particularly acute and where BGR! running groups haven’t yet proliferated. “We’re really hoping to get into those areas and get people running,” Hicks says. It all adds up to an impressive startup for a grassroots operation with its roots at MTSU.